as a kid, summer was my favorite season. I grew up in southern california, so summers were hot. It meant no school, swimming lessons, watermelon, and my birthday. I remember growing watermelons and tending to our peach tree. When I got to middle school and high school, it meant summer school, SAT prep class, extra curricular activities, and summer reading (which, I never really did thoroughly. Oops). By college, summer meant more money because summer school was so stinking expensive and more hours at work. Now, as a working adult (actually, "adult"), summer means what it meant to me as a kid, sans the swimming lessons- no school, watermelon, and my birthday. Plus the extra daylight which really does make the day much much brighter. and Now that I bake, summer brings all the stone fruit and berries I could ever imagine. It's great, except I'm so stingy that I won't let myself eat the actual fruit since I'd much rather bake with it. 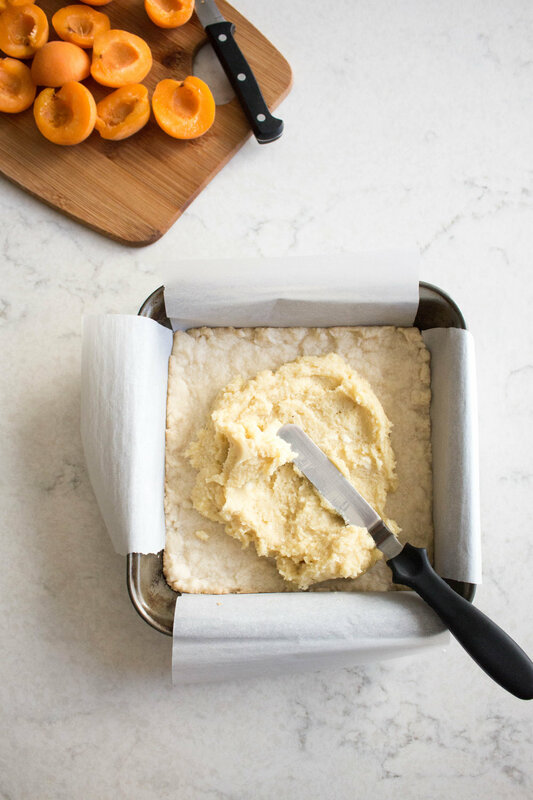 So, tl;dr, summer is great, fruit is good, and here are some apricot almond bars. these bars are buttery and rich, and not too sweet at all. 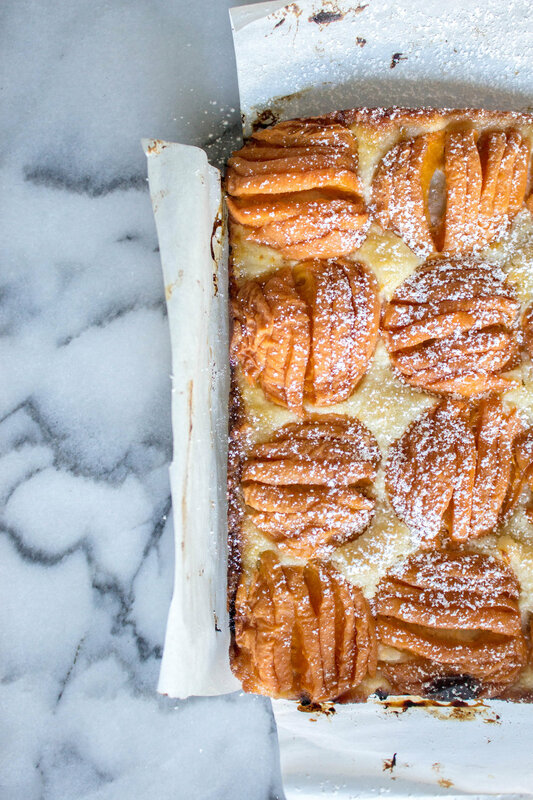 the sweetness for this dessert really depends on how ripe your apricots are. my bars were more on the tart side because the apricot weren't completely ripe, but i like things a little more tart anyway. 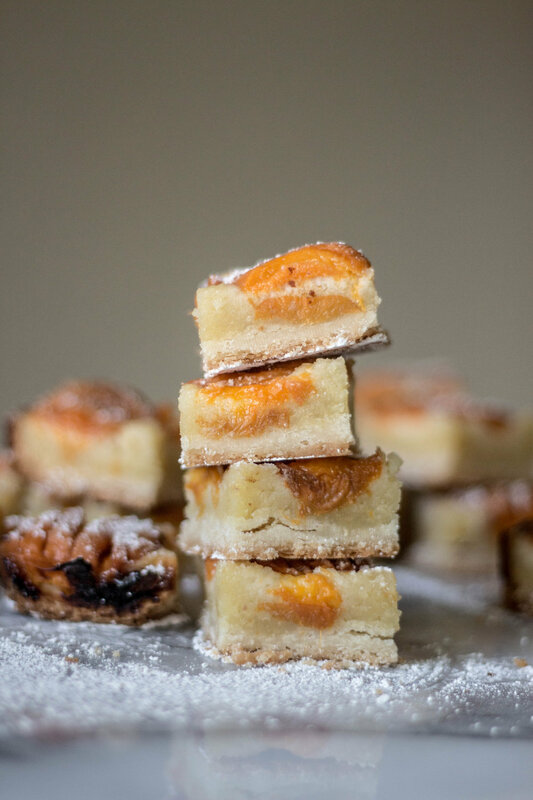 your teeth sinks into a layer of jammy apricots, creamy almond filling, and a buttery shortbread crust with each bite. if you have a food processor, great- head on over to deb's site for instructions and let me know which food processor you recommend, too!! i am cheap and do not own a food processor, so the instructions below involve zero food processing and machinery and rely solely on your own arm strength. which you don't need very much of, because my arms have not touched weights in years. baker's notes: the original recipe from Deb of Smitten Kitchen uses pistachios. I used almond meal instead, which reduced my prep time by a couple minutes. Feel free to try it with different nuts or stone fruit! when it comes to arranging the fruit, do whatever floats your boat. i lined mine up strategically in a hashtag fashion, but you can scatter it as you please. remember that the more you "scatter", the less fruit you'll use. 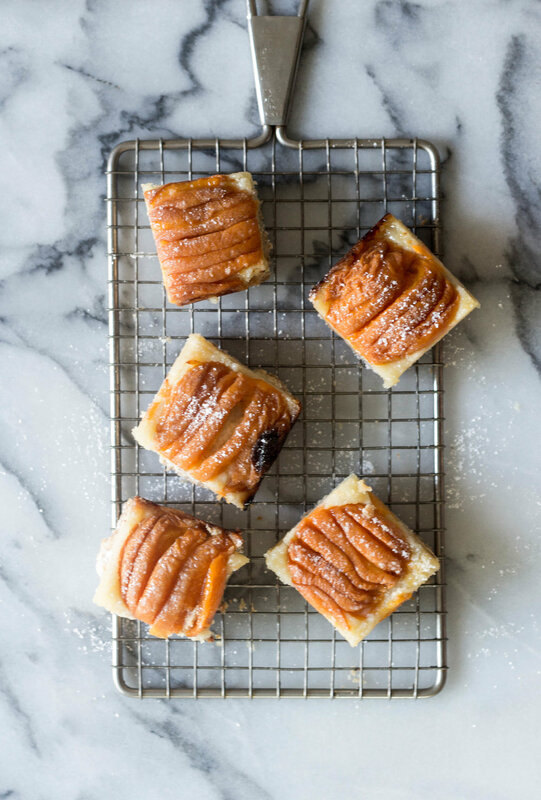 preheat oven to 350 f. line an 8x8-inch square pan with parchment paper, ideally with parchment paper overhangs. make the crust: in a medium bowl, stir together the flour, salt, and sugar. cut the butter into chunks, and cut it into the flour with a pastry blender or your fingertips. the dough will look dry, but it'll come together. add a couple teaspoons of water if you really need it. work the flour and butter together until a dough forms. 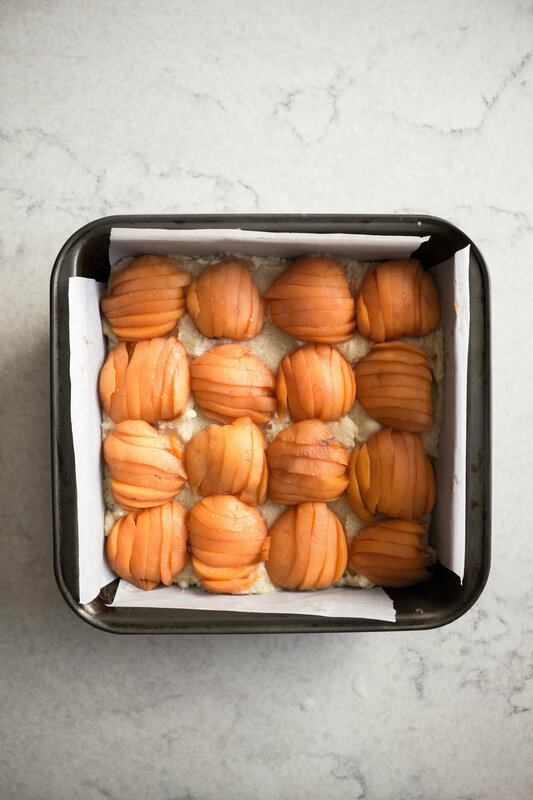 transfer the dough into your prepared baking pan, and press it evenly in the bottom of the pan and slightly up the sides. bake for 15 minutes, until very pale golden. let it cool slightly, then transfer the pan into a fridge to cool completely. a freezer for 10-15 minutes works too, but don't forget about it! make the filling: stir together the almond flour, sugar, all-purpose flour, and salt. mix in the softened butter until it's a smooth paste. add the extract, if using, and egg; stir until combined. spread filling over cooled crust. cut the apricots and remove the pits. slice up the apricots as you'd like and place over the almond filling. decorate as you please- cut in half and place face up or down, sliced up into strips and fanned out, or strips arranged in some geometric fashion! bake the bars for 60-70 minutes, or until they are golden brown and a toothpick inserted in the filling part of the bars comes out batter-free. let the bars cool slightly in the pan, then chill completely in the fridge. dust the bars with powdered sugar. cut the bars into squares, and serve!